uBuyFurniture's stackable chair collection offers a solution for every business, home office, church, and school. 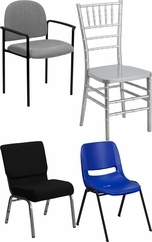 We have stackable church chairs, student chairs, meeting room, and school chairs, in many different styles and colors. With comfortable seating, a stack feature that allows you to store the chairs neatly when not in use. All Stack Chairs ship FREE to the continental U.S., usually in 1-2 business days!